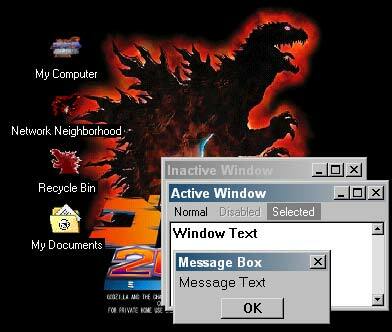 Here is some neato Godzilla stuff for you to download and play with. Not much I admit but well worth the effort to get. Everyone is doing desktop themes these days it seems and now so have I! I created this theme by hand using Notepad. I didn't use one of those sissy theme makers. follow the instructions in the readme.txt file and this theme will install completely. Have you ever downloaded a theme and it would only half install? I have and I know why! They were made with one of those crappy theme making programs, thats why. Thanks to Corey G. and Rob Pettipas, they made the cursors and icons I used in the first theme. 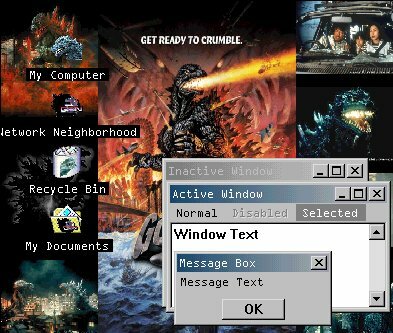 The second theme is dedicated to Godzilla 2000: Millennium, the newest Godzilla film that Toho is working on. 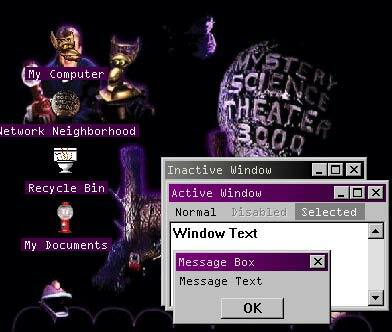 The third theme is strictly MST3k! Special thanks to Jason Fraser and Varos for hosting these themes. Visit Varos Themes for more neat themes such as these made by me and others on a variety of topics. I would also like to take this time to thank TheProf, Talus, and Alden for helping me to test these themes. 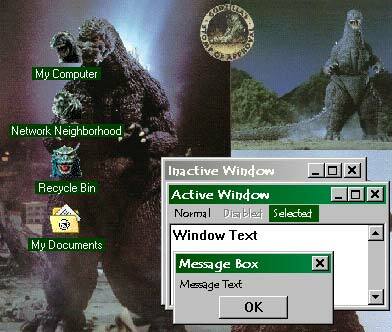 To use this theme you must be running Windows 98, Windows 95 OSR2 or Windows 95 with Microsoft Plus! pack addition. The theme is in a zip file. Create a temporary folder and save the zip file to it and then extract it and follow the instructions in the readme.txt file. I recieved a complaint that installing these themes wipes out the theme folder... what a load of crap! NO IT DOESN'T! The doofus installed the theme in different folder from the rest of her themes and then ran the theme... down at the bottom of the drop down menu where it says "other" click on that and browse back into the themes folder. Sheesh!